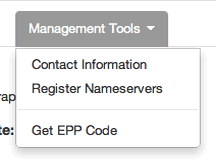 IMPORTANT: It is ultimately the responsibility of the domain name owner/registrant to keep their domain name(s) registration and profile data current and active. You can contact us any time to inquire if you are unsure, or do a free whois search to review the details of your domain name profile and registration status here: http://whois.icann.org. Did you register a domain name from the One World Hosting site before April 2014? 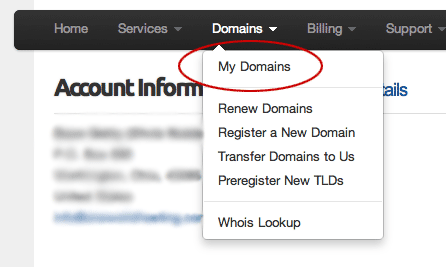 MANAGING A DOMIAN's AUTO RENEWAL: If you have a One World Hosting account you can do the following to either enable or disable a domain name's auto renewal. You will still receive 5 email reminders of your domain names pending expiration starting 60 days from it's termination date. 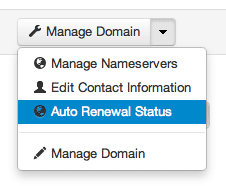 and click on the Renew Domains option.